Aigital 2.5mm Male to 3.5mm audio adapter, Adapt a 3.5mm stereo plug to a 2.5mm plug, making your favorite headphones or other devices compatible with most pro audio and home audio equipment, such as speaker, headset. - Connector 1: 2.5mmStereo Jack Male . 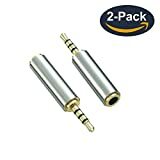 - Connector 2:3.5mm Stereo Jack Female . Gold-plated connectors resist corrosion and ensure minimal signal loss. Made of solid brass copper, with a much longer service life compared with those plastic one. A hassle-free 12-month warranty and friend customer service. Please note,this adapter doesn't work with the microphone. Adapt a 3.5mm stereo plug to a 2.5mm plug, making your favorite headphones or other devices compatible with most pro audio and home audio equipment, such as speaker, headset.